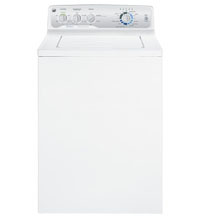 The GE GTWN4250DWS is another basic, no-frills top load washer that delivers high performance and a variety of washing options. With sixteen wash cycles, including jeans, towels, sheets, delicates, and prewash, and six temperature selections, you can program your cycles specifically to your washing needs. We liked the simple controls along the back panel, which were self-explanatory, and how quietly the machine ran. Additionally, the machine detects the load size and adjusts the water appropriately, saving you in energy and water costs. For $494.99, the GE GTWN4250DWS is a great bargain.